The headline alone is guaranteed to get your attention. 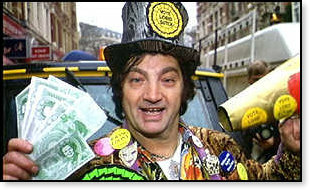 In reality there really was a man in England who called himself Lord Sutch and who ran in several British General Elections as the head of the official "Monster Raving Loony Party." Sadly he committed suicide in June,1999 at the age of 58, but was beloved even by the people he was lampooning. He campaigned in 40 elections and although he lost every one of them he nevertheless won the admiration of the British public for bursting the pomposity of so many self-righteous Members of Parliament. David Edward Sutch was a musician and also the 3rd Earl of Harrow. He formed his party back in 1983, which received official sanction to stand for Parliament. Known for his bizarre policies he in fact helped unseat a Labour Party MP thanks to many members of the general public deciding – for a laugh – to support him. Who would have thought that decades later, here in the United States of America, the Democrat Party would itself become America's own "Monster Raving Loony Party." 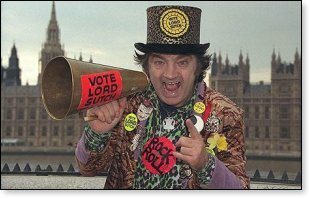 But unlike the deliberately silly party of Lord Sutch, what the Democrat Party has now become is toxic and deeply worrying. The Democrats have indeed lost their minds on things big and small. Leftists who proliferate within the Democrat ranks appear to be quite comfortable with killing infants even after they are born. Most left-wingers I have spoken to are in favor of euthanasia. One college student told me he was entirely willing to see the elderly removed – painlessly of course – as in Huxley's 1932 dystopian and futuristic novel, "Brave New World," or in the dark equally futuristic movie, "Soylent Green." Perhaps that dread future is here and now! Federal legislation to prevent it happening. He calls it the Kitten Act! Appearing on NBC NEWS (one of the fake news outlets,) he railed that such practices as killing kittens after being experimented on is "archaic" and "horrific." Certainly it is, but for Merkley no such language passed his lips when the question about human babies being killed was raised. 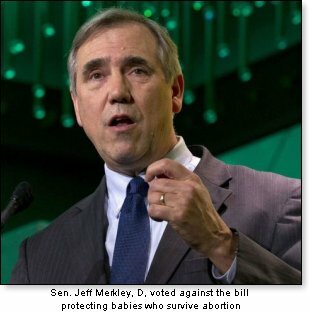 Then, Senator Jeff Merkley voted against the Born Alive Act and agreed with 43 other Democrats that human beings could be put down. In previous articles I have coined the phrase, "The Socialist Conveyor Belt in our Public Schools." I recently saw another writer opine that so-called Higher Education is merely a high priced socialism re-education camp. This is another malign policy of the Left, which has led to legions of young students being indoctrinated into socialism and led down a fearful yellow brick road. That is why some 49.6% of millennials would prefer to live in a Socialist country, a la Venezuela! Now the loony Democrat Party, parroting their own Lady Sutch in Congress, namely Alexandria Ocasio-Cortez, is calling for free college when college debt has reached an astounding $1.5 trillion. We can thank that wrecking ball, one Barack Hussein Obama, for nationalizing student debt among the host of other anti-American policies he created that now roil America. Thanks to Obama we now have the loony tunes Democrat Party edging closer and closer to hastening America's demise. Americans aged 18 to 29 are as positive about socialism (51%) as they are about capitalism (45%). This represents a 12-point decline in young adults' positive views of capitalism in just the past two years, a marked shift since 2010, when 68% viewed it favorably. The idiocy that now spews from the mouths of so many Democrat politicians puts the Party at odds with the norms that have obtained throughout history. The essential truths that were enunciated by the classical philosophers such as Aristotle, Plato, and those who came much later such as Locke, are being challenged and even overthrown. Even statues, which represent American history, are being toppled one after the other. The Western World in the main has based its ideas from Judeo-Christian thought. But such objective truth or reality is now being swept aside. Mainstream and empirical belief was that there are two genders, but the mental troglodytes within the Left leaning community – who now infest the once noble Democrat Party – will have none of it. Even American history is considered subject to intense scrutiny rather than honored. The Democrats and the mainstream media (ABC, CBS, NBC, PBS, CNN, MSNBC, along with the new York Times and the Washington Post), have all thrown in with the latter day leftist and socialist iconoclasts who hate America, hate our duly elected President Trump, hate the Constitution, hate Israel, the only true ally and democracy we have in the Middle East, hate American military involvement overseas and consider the work of ICE as evil. Even the nuclear family is suspect and the list goes on and on. But perhaps none of this matters. After all, the ex-bartender and now self-elected head of the Democrat Party in the House, AOC for short, has told us – among other loony tunes things – that unless we end bovine flatulence, the world will end in twelve years. Such is the "Monster Raving Loony Party" that we know now as the Democrat Party. It all would be so funny if it wasn't so tragic. 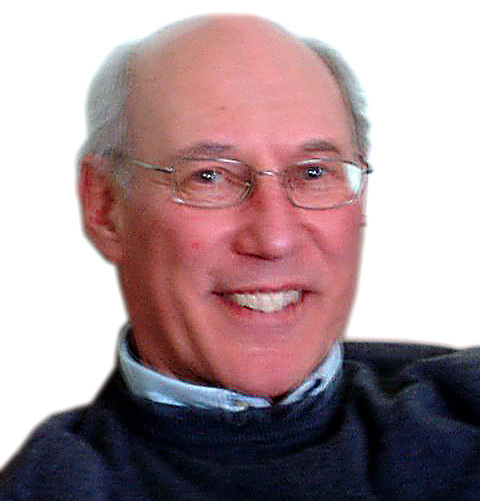 Victor Sharpe is a prolific freelance writer, published author of The Blue Hour, a collection of thirteen short stories and author of the four volume series titled Politicide, which details the threat of Islamic fundamentalism towards Judeo-Christian civilization, Israel and the West.